Celebrate the 50th Anniversary of Star Trek with this Stunning Coin! “To boldly go where no man has gone before.” Star Trek did not become one of the most successful franchises in television history by accident; it achieved this feat by telling sophisticated stories and pushing the boundaries with a diverse cast. In 1964, there were not many non-white roles in television industry. Star Trek did not follow this status quo and created a multi ethnic crew including an African woman (Uhura), a Scotsman (Montgomery Scott) and a Japanese American (Hikaru Sulu). The most distinguishable member of the crew was an alien, the half-Vulcan Spock. Spock was born in 2230 on the planet Vulcan and initially served as ensign aboard the U.S.S. Enterprise. When James T. Kirk took over as captain Spock was named first officer and science officer. Being half-Vulcan and half-human put a strain on him at times but he continued his devotion to logic and discipline. In Vulcan life it is very favorable to control all emotions in order become a completely logical being. Spock provided a logical and level-headed voice on the U.S.S. Enterprise when humans were making emotional and illogic decisions. 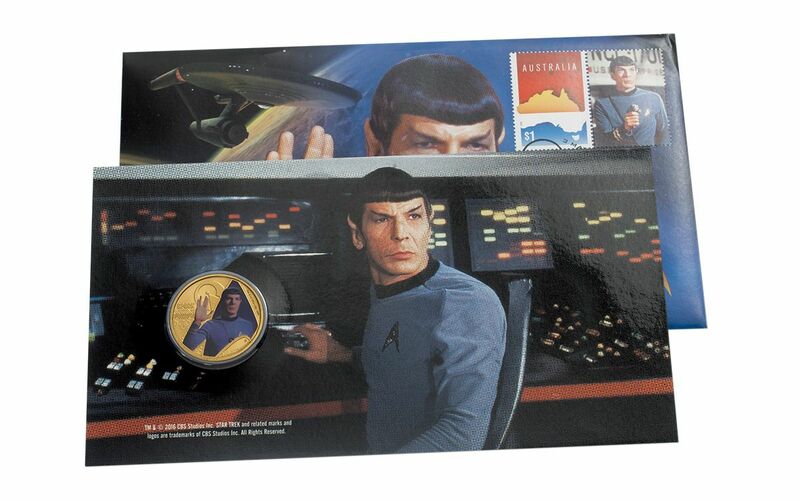 This 2016 Star Trek Spock stamp and coin cover brings the legendary character to life. Vibrant Color and a Piece of Star Trek History! 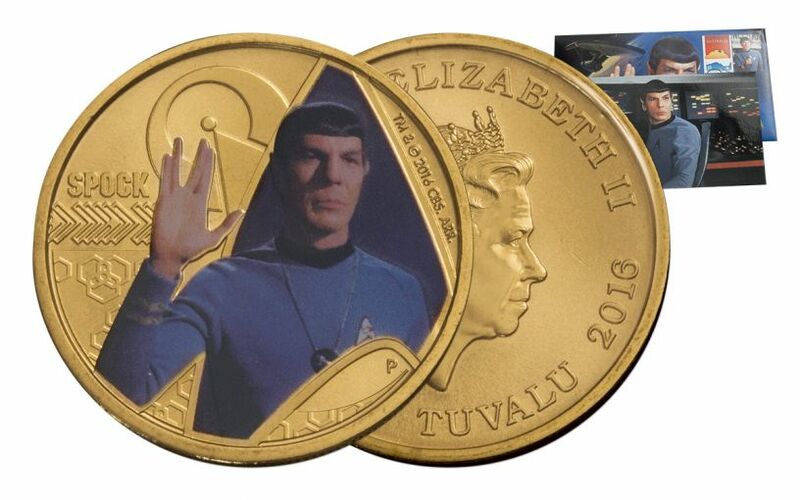 Your Star Trek the Original Series Spock Coin was stuck in 2016 by the artisans at the Perth Mint. 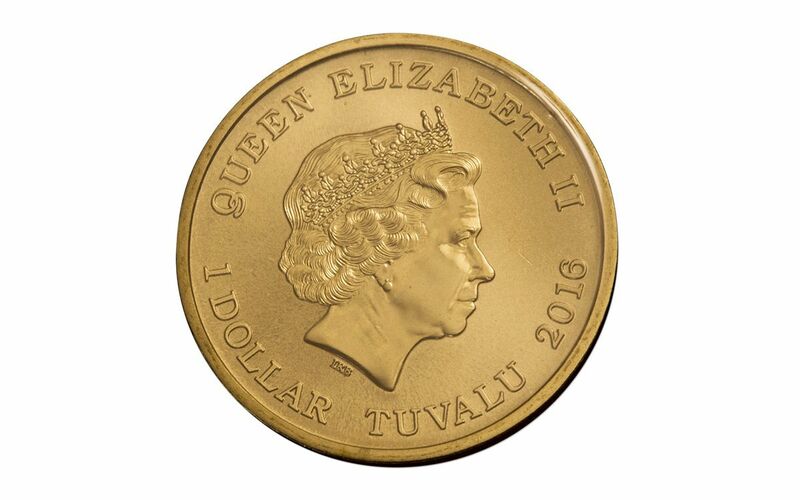 The obverse of the coin features the Ian Rank-Broadley effigy of Her Majesty Queen Elizabeth II while the reverse portrays a full-color image of Spock giving a Vulcan salute, which usually accompanies the words “live long and prosper.” Minted in 13.5 grams of Aluminum Bronze each coin is $1 legal tender in the Polynesian island, Tuvalu. Each of these Brilliant Uncirculated aluminum bronze coin is housed in an illustrated card featuring Star Trek imagery with circular windows revealing the reverse and obverse designs. An official Australia Post $1.00 stamp is affixed on the card and is postmarked for the first day of issue and the back of the card includes Australia Post’s Seal of Authenticity. If you’re a Trekkie we know you won’t want to miss out on this opportunity. 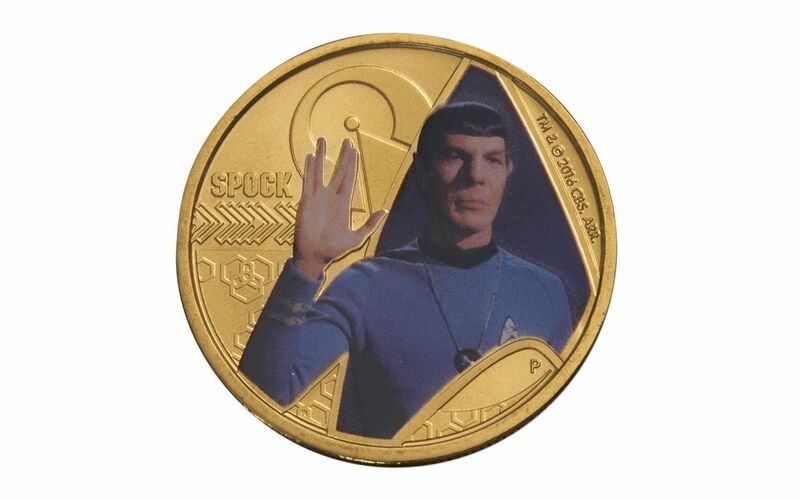 We expect these Spock coins to be beamed up quickly, so get yours today!